In our recent study published in 2018, we show how evaporation enhances the lifetime of bubbles even without addition of surfactants (cover page of journal PDF issue). We quantify this process, model it, and give an illustration of the process in an analog experiment with salt, which shows that crystals of salts can even nucleate at the top of the bubble (illustrating the increase of concentration at the top). The crystals once formed, slide down the cap, meanwhile, the drainage of the bubble can be stopped, leading to constant thickness values (see figure) and very long lifetimes. We derive the model balancing the evaporation and drainage to show how a plateau in thickness (and long lifetime) can emerge due to evaporation. 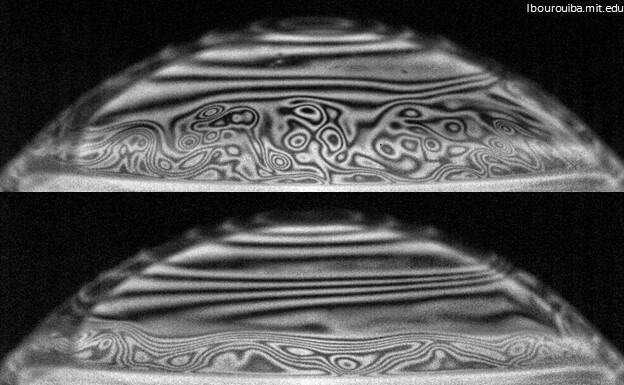 On the right: a very long-lived bubble (can be up to days) in an advanced stage, showing patterns of double-diffusion (thickness and salinity). The segregation of regions with distinct thickness profiles is evealed by interferometric imaging. For more, see Poulain, S., Villermaux, E., and Bourouiba, L. (2018) Ageing and burst of surface bubbles. 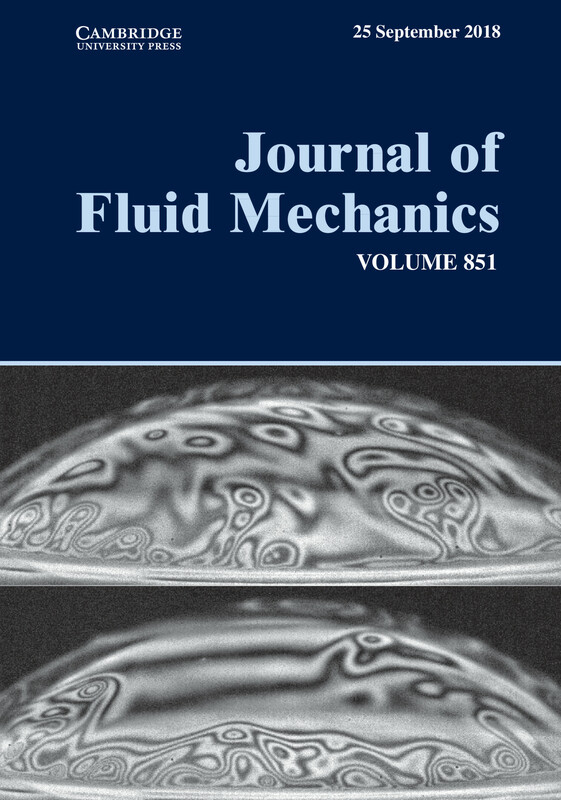 Journal of Fluid Mechanics. 851: 636-671. Selected for volume cover page: PDF. And more on this research track here.